It’s important to try and get outside and spend time in nature. Just unplug and get in touch with ourselves and the world around us, de-stress and unwind. Unfortunately, there may be some cause for concern with a new tick-borne disease that has emerged and is even worse than Lyme disease, and can prove to be fatal. The Powassan virus was relatively unheard of, with the first reported case appearing in the 1950s in Ontario. Durland Fish, a professor emeritus of epidemiology and microbiology at the Yale School of Public Health stated that it wasn’t considered a huge problem because, unlike deer ticks that are most commonly associated with Lyme disease, it was discovered in a species of tick that very rarely bite humans. But now it’s begun to appear in deer ticks. What Is The Powassan Virus? The Powassan virus is a much rarer and deadlier version of the bacterium responsible for Lyme disease, which is well known for being transmitted by the deer tick. The virus can cause inflammation in the brain that has been linked to death or permanent disability which is the unfortunate result of 60% of cases. As of June, 2017, 75 cases of severe disease have been reported to the Centre for Disease Control and Prevention. This video shows the devastating effects of the Powassan disease and just how quickly it can infect and spread. 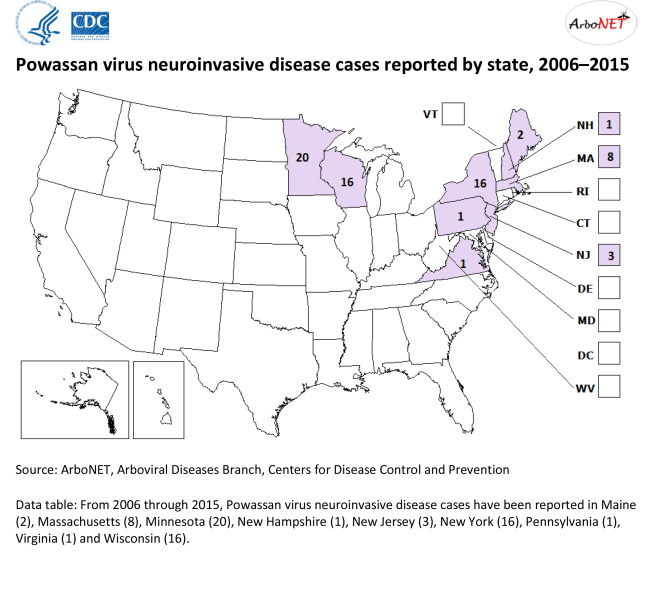 Cases of the disease are concentrated in the North East of the United States, but evidence shows that it has the potential to spread across the country. What separates this Powassan from Lyme disease is just how fast it can infect a person once bitten. Lyme disease takes 24 hours to pass from the tick to the host, whereas Powassan only takes 15 minutes. Experts can’t say for certain how many people have been infected as only the most severe cases are reported and logged. “It’s quite possible that many, many more are infected and not identified because their symptoms are mild,” stated Ann Powers, chief of virology activity in the arboviral diseases branch at the CDC. Right now, it is unclear just how far and how quickly the virus can spread. There is evidence that the disease is on the rise in the northeast; a 2013 study showed that the percentage of deer showing signs of infection had been steadily increasing between 1979 and 2010. Since deer ticks pick up pathogens from the deer they bite, it is likely that the amount of ticks infected will rise as well. A recent report from the Maine Medical Center Research Institute backs that estimate up. Researchers found that 7 percent of adult ticks and about 10 percent of ticks in the nymph stage carried the Powassan virus. However, some are not convinced that the disease is on the rise. Rafal Tokarz, an associate research scientist at the Center for Infection and Immunity at the Mailman School of Public Health at Columbia University believes that the growth is minimal. Tokarz and his colleagues were examining ticks in the state of New York and found only 1 to 2 percent of ticks studied carried the Powassan virus, and 20 percent carried Lyme. “If it’s 20 percent then your chances are one in five that the tick on you will give you Lyme,” he added. What experts can agree on is exactly how the virus attacks the body. “The virus goes up to the brain and attacks the parts that keep you awake, keep your heart rate steady and your breathing drive going,” explained Dr. Jennifer Lyons, chief of the division of neurological and inflammatory diseases at the Brigham and Women’s Hospital and an assistant professor of neurology at the Harvard Medical School. As of right now there is no treatment for the virus, only supportive care until the body is able to beat it on its own. Statistics for those who develop a severe version of the disease are devastating; 10 percent succumb to the disease, and 50 percent develop some sort of neurological disability. The best course of action to protect yourself and your family from tick borne diseases is to use a tick repellant, avoiding areas where ticks are common like tall grass or cornfields, checking for ticks, and showering after being outdoors. Enjoy nature and all it has to offer, but remember to stay safe!